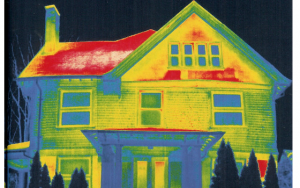 This thermal image of a house reveals the variations in temperature. The overly-warm attic suggests heated air is flowing up through air leaks. Do you have rooms in your house that are too cold during the winter or too hot during the summer? It may be a seasonal problem or it may happen year round. The first thought you may have is that you need a better, bigger heating and cooling system or possibly new windows to eliminate draft. At My Home Science, we often emphasize the fact that all buildings are systems, including your home. This is one of the most important things you will ever need to know about your home. A problem that you experience in one area of your home might be a symptom of something else happening in a different area. But what exactly causes temperatures to be so uneven between different areas of the same building? In this post we will discuss some of the possible causes and what you can do about them. Stack effect is a physics phenomenon and relates to the way air moves inside buildings. This is the second most important thing to learn about your home. In simple terms, the heated air rises through convection and will seek to escape through the upper levels of the building. That movement creates a low pressure area in the lower levels of the building. As a result, outside air is sucked in from the lower levels of the building – most noticeably from basements and crawl spaces. As the air moves through the building in this fashion, lower levels can feel cold and drafty, and the upper levels will tend to feel hot. With all that air leaking in and out of the house, your heating and cooling system has to work harder to keep up. On days that are extremely hot or cold, your entire house may feel uncomfortable. The video below does a great job of demonstrating the stack effect and its impact in different areas of your house. In this video, Larry Janesky of Dr. Energy Saver, takes you through a typical home, showing how air flows through the house cause energy inefficiencies – and discomfort! The air that you pay to cool and heat – and the air that you and your family breathe – reaches the rooms in your house through ductwork. Ducts play an important part in delivering comfort to the entire house. Unfortunately, ductwork is also one of the areas most often overlooked and neglected by contractors and homeowners. In a previous post, Tim Snyder addressed common ductwork failures that can impact home performance and what you can do to fix them. Use it as reference to evaluate your home’s HVAC ducts. A lot of energy waste and comfort problems in US homes happens due to improperly installed, outdated and insufficient insulation. Many attics in the U.S. aren’t insulated according to the U.S. Department of Energy’s recommended R-Value for the region they’re located in. Poor choice of insulation materials is also a common factor. Fiberglass insulation, -– a popular material for above grade applications – is a poor choice for areas such as the basement and crawl space. Below-grade areas are naturally humid and prone to water accidents. Fiberglass absorbs water that causes a loss to R-Value. Moisture also causes fiberglass to sag, and in ceiling applications to even fall down, opening gaps in the thermal barrier. Many insulation problems happen because builders and installers fail to understand that cellulose and fiberglass do not prevent airflow. Spray foam is the only insulation material that seals gaps and holes and stops airflow. Of course spray foam adds R-Value at the same time. Just like the butler in detective stories, when it comes to home comfort problems, the windows are often the cliché suspect. Of course, if your windows are old, they most likely lack some or most of the characteristics of modern, energy efficient windows. Single-pane windows are always the coldest spot in an exterior wall. During the winter, windows create a “convective loop” – heated air rises, when it comes in contact with the cold glass of the window it cools, causing this air to sink – which simulates a window draft. During the summer, the sun’s heat can make rooms uncomfortable if your windows are not built with Low-E glass that deflects thermal radiation. Yet, you can have brand new, energy-efficient windows and still experience window-related discomfort. Why? Windows are one more of the many areas where air sealing and insulation are often neglected by builders and installers. In other words, the problems you might be experiencing have nothing to do with the window itself, but in the installation – especially the shim space and around the windowsill. So before you think about replacing your windows, have a technician run some tests and make sure they are really the cause of the discomfort. Check out this video about air sealing the shim space. Being uncomfortable in your own home is no laughing matter, and to add insult to injury, comfort problems are closely related to energy waste. You are most likely spending more than you need in energy bills. The above are just some of the most common causes of comfort problems in a home. There are many other factors that might be contributing to the discomfort you’ve been experiencing. In order to solve the problem, you will have to find out its cause. Otherwise you’ll be spending money without achieving the results you sought. We recommend hiring a professional energy conservation technician to perform a comprehensive home energy evaluation. This typically includes a blower door test, thermal imaging and other diagnostic tools and procedures. At the end of the evaluation, you should have a good plan to tackle all the comfort issues, prioritizing those that will provide the best results for each dollar you invest.